After not speaking with the Northern California media for a good week, Golden State Warriors star Kevin Durant absolutely laid into those covering the team following Wednesday night’s 39-point blowout win over the San Antonio Spurs. While Durant showed himself to be a little less than professional in his rant directed at said media, he was in no way wrong with the point he was attempting to convey. This was in response to an article the longtime Warriors scribe published earlier in the day openly wondering why Durant has been standoffish with the media. 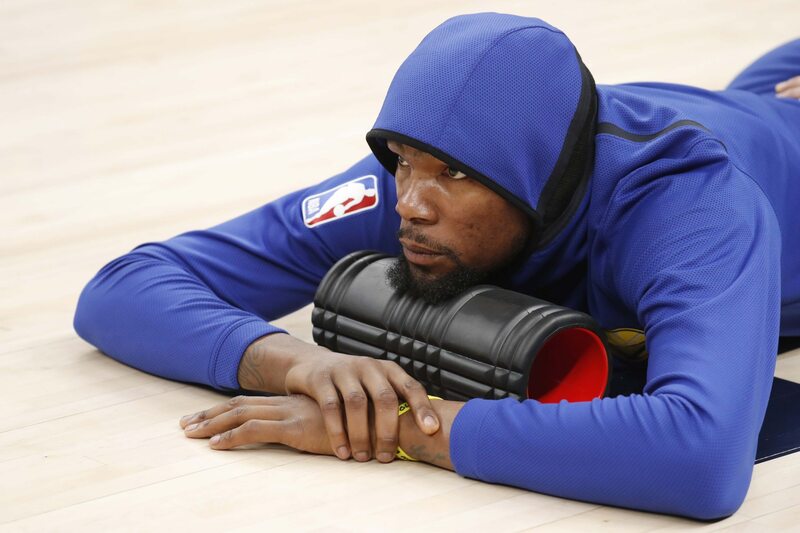 “On Day 8 of Kevin Durant’s media silence, the superstar small forward demonstrated an impressive burst of speed, right off the completion of an intensive workout. KD cruised across the practice floor as two Warriors public-relations officials beseeched him to turn back,” Strauss opined. “Reporters had gathered with intent to ask questions of a man who’d gone underground concurrent with loud rumors of a New York Knicks future. The Warriors know how this looks and want KD answering questions rather than dragging this out. Instead, Durant shook his head as the PR officials flanked him. It might have been a childish rant from Durant. He might have showed that his skin is thinner than other stars — namely LeBron James. But again, he was not wrong. Durant has not talked openly about his impending free agency much at all. All the noise we continue to hear comes from the media — more than likely information not being leaked by Durant’s camp. When Durant has talked about free agency and his future, he’s made it perfectly clear where he stands. Money will play a role: Durant has been more than open that finances will help dictate his free agency decision. Shouldn’t this have been seen as somewhat of a sign that Durant was strongly leaning towards taking the extra cash in the Bay Area? Tea leaves and such. Remember, the Bay’s Silicon Valley has acted as a financial boon since KD signed with the Warriors. Teams are doing everything possible to find the cap room to attract this summer’s top free agents — Durant included. But he’s not about the recruiting process that brought him to Oakland back in 2017. What environment would that be, Mr. Durant? Maybe the Warriors’ soon-to-be new San Francisco waterfront home, the Chase Center? That is about the extent of Durant’s comments regarding free agency this coming summer. He signed a one-year deal with a player option for the 2019-20 season back in July. That was a way for Durant to eventually cash in on a super-max deal after he took pay cuts to help the Warriors keep their core group together over the past two summers. At this point, we have no idea where Durant’s head is. Madison Square Garden and Rucker Parker might be too much for him to pass up on. The idea of Southern California and Hollywood could be enticing. But nothing Durant has done or said indicates that he already has one foot out the door in Oakland. Regardless of the Knicks and Clippers adding cap space for the summer, Durant’s mind is on the 2018-19 season and a possible three-peat with the Warriors. Why is this so hard for the media to comprehend?